Each year the circus comes to town and I watch the train come to a steeming halt. Lions, tigers, elephants, zebras, minature ponies, lamas, and the rest of the menagerie spill out the doors like the last survivors of Noah's Arc. Performers galavant around with bike horns, whips and motorcycles. And musicians masquerade. Ringling Brothers and Barnum & Bailey, The Greatest Show on Earth shock Oakland this year. 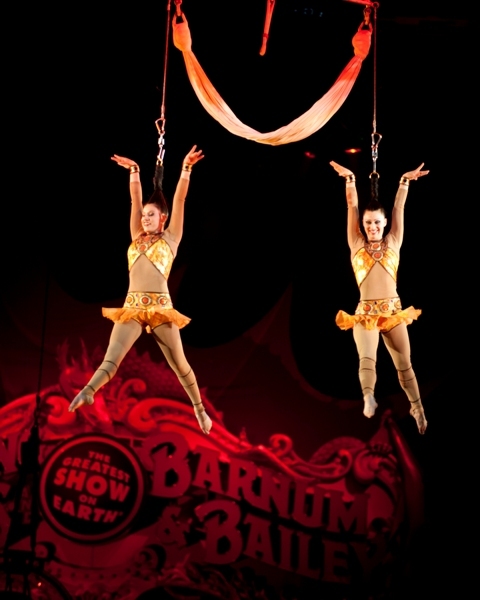 Traditional circus performances mixed with daredevil stunts and new sideshow acts kept the audience screaming and squirming. My favorite: The Hair Hanging Heroines were eye-popping. Original music throughout the show came from composer Michael Picton. Schemingly, I listening to the circus band perform. Observantly I memorized the cues. Slowly I plotted to take over.